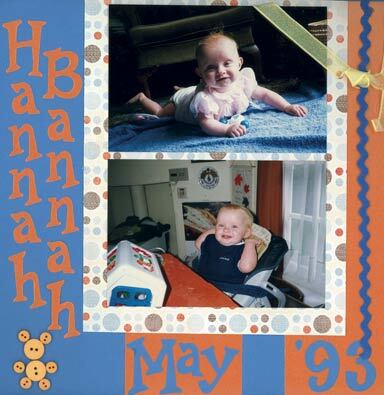 This baby girls scrapbook layout put me firmly in touch with my feminine side. Where better than in a layout celebrating his baby daughter for a guy to indulge this side of himself?! As our babies grow, it can be hard to remember that cute name we used to call them - much to our children's relief. Baby Scrapbook making is a great way of blending the visual memory of what our babies looked like, with the memory of the 'sound' of that name we used to call them. Blue and orange feature strongly in these photos so I went with these colours - reversing the background cardstock with the Sissix lettering. I also picked out blue and orange in the embellishments and paper design. I figured that on this layout, it might look good to use a paper with a spotted design on a light background. Anyone who's been around babies knows that the lighter the background - the more likely it is to get spots on it! Sassafras Lass provided the perfect design. Any baby girls scrapbook layout would benefit from textures like ribbon and felt. I was able to tie two ribbon embellishments together - although my attractive bow didn't survive the rigours of the scanning machine! I decided to make a 'teddy bear' using orange buttons. It was only as I was placing them that I realised I could use the buttonholes to good effect. SKETCH TEMPLATES TO THE RESCUE! I have an excellent resource now for layout ideas - which is a book by Jen Gormley, crammed full of sketched templates for page layouts. I wish I'd found it before I made most of my layouts, but for next time I'll certainly use one of Jen's sketches - especially when I don't have any inspiration (ie. quite often!). I won't pursue any scrapbooking ideas for baby girls until I've got my template right. There's a great sample on this page of how Jen can create a sketch template to give life to her layouts.